Low-Fat Doesn't Have to Mean No Flavor! I love lasagna, but I don't make it that often. Mostly because it does take a little time to prepare. Also, because it is heavy and usually full of fat. I have made low-fat lasagnas in the past and they came out fine but nothing to rave about. This one is different. I think I hit on something here. This lasagna was tasty and hearty but not overly filling or fattening. Plus it was a bit easier to make because I used the no-boil lasagna noodles. It saves a lot of time and aggravation. I used tomato sauce on the top and bottom layers of the lasagna. The garlic bechamel sauce dominates the middle layers, so the flavor is more creamy than a traditional lasagna which uses mostly tomato sauce throughout. It got all thumbs up from the sometimes picky family, so I hope you give it a try. I think you will be pleasantly surprised with the results! Preheat oven to 375. Cover a baking sheet with foil and set aside a 13x9x2 pan. Heat olive oil in a large non-stick pan over medium heat. Add leeks and cook until wilted and translucent but not brown; around 5 minutes. Add garlic and cook for 30 seconds to one minute. Raise heat to medium high, add turkey, salt, pepper and cook until no longer pink. Remove from heat and add basil. Drain in a colander and set aside. In bowl, combine beaten eggs, ricotta cheese, 3/4 cups of the shredded cheese, 1/4 cup Romano and nutmeg. Set aside. Spread 1/2 of the jar of sauce or 1 1/2 cups your own sauce on bottom of pan. Layer in order, 4 uncooked lasagna noodles (slightly overlap), then 1/2 of the ricotta cheese mixture, 1/2 of the browned turkey mixture, 1/2 the spinach and 1/2 of the bechamel sauce. 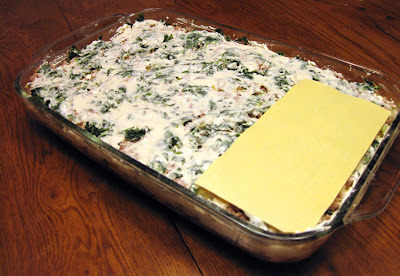 Next layer, 4 uncooked lasagna noodles, remaining 1/2 of the ricotta cheese mixture, remaining half browned turkey mixture, remaining half of the spinach and remaining 1/2 of the bechamel sauce. Next layer, 4 uncooked lasagna noodles, remaining 1/2 jar of sauce or another 1 1/2 cups of your own sauce, remaining 3/4 cup shredded cheese and remaining 1/2 cup of Romano cheese. Spray a sheet of foil with cooking spray. Cover pan with foil and cook for about 1 hour or until bubbling. In a medium saucepan heat creamer/milk until hot but not boiling. Heat butter, oil and garlic in a medium saucepan until garlic is fragrant. Add the flour and stir until smooth. Cook over medium heat until the flour mixture turns light golden brown, about 5 minutes. Slowly add milk to flour mixture; whisk until smooth. Add salt. Bring to a boil and cook for around 6-8 minutes, until sauce thickens. Remove the pan from heat and add nutmeg. Set aside. I LOVE lasagna, I haven't made it in ages. Will have to try this one soon, I love all the light substitutions. Wow, this lasagna looks incredible. I would gobble this right up. Congrats on the new camera! A healthier yet super yummy lasanga aer always one of my goals. Low fat usually gets a bad reputation, but I agree, Low fat can mean flavor too! The lasagna looks great! ttfn, I know what you mean about cooking a lasagna for one! Sometimes I cut it up into smaller portions, double wrap it in foil and freeze it. That way I can pop it out of the freezer and into the oven and have a piece whenever I want! P.s. I'm not good in traffic either. Oh this looks great. 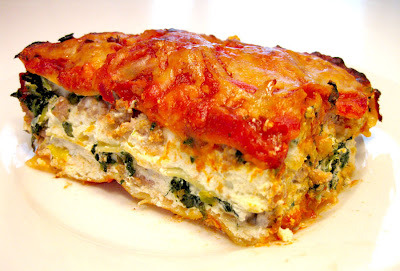 I have such a weakness for lasagna, will have to try this! The picture didn't turn out bad at all - it looks delcious. 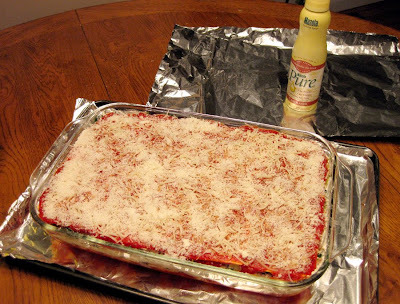 A healthier lasagna...who can resist? I made many lasagna dishes in my life time but never with turkey,this lasagna not only looks good is very very good,bambola. Hi, I did an internet search for turkey and spinach lasagna and your recipe came up and it looked great so I made it... it was so tasty! Thank you so much! just tried this recipe tonight...it was great! I will definitely be making this again!